Update 6/13/11– I played a three-hour party gig at a coffee house yesterday with these drums. They are very transportable. The cymbal and drum pads fit into a duffle bag. I wrapped them in towels to protect them. I put the pedals and the kick drum pad into a small roller bag, along with sticks, the legs of the drum throne, etc. 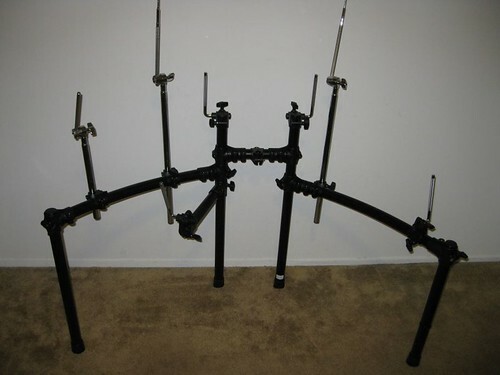 I took the middle piece with the drum brain on it off, but left all the other hardware attached, and put the two halves of the rack in the back seat of my Civic. I ran it into an Ultrasound 50-watt acoustic guitar amp as a monitor, and then ran a direct out from the amp to the P.A. I don’t have a drum amp, but for coffee house setups I think this works fine. The owner of the place was worried about having a drum kit in, but midway through he actually asked us to turn UP. This was a trio with a guitar player/ singer and a bass player. The guitar player had a reworked silverface Champ and the bass player had a Mesa Boogie Walkabout Scout. We played mostly Beatles. I used the “Oldies” kit. It was great fun! 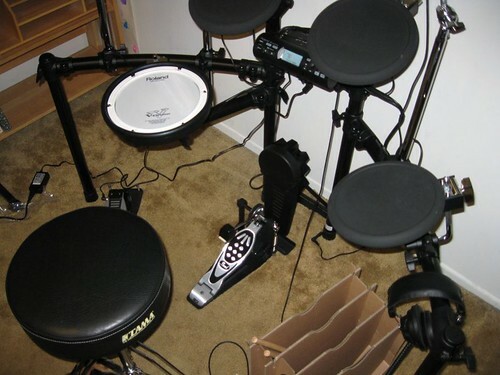 The electronic drums arrived today. The stand comes in one box, the rest of the kit in another. 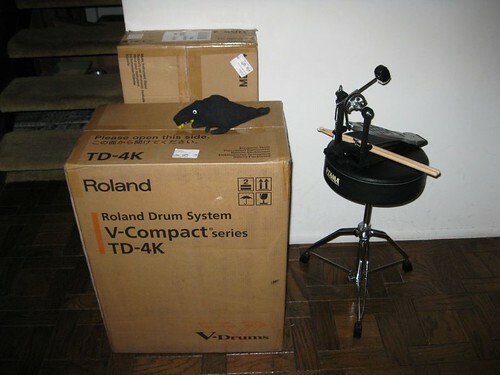 Here are the two boxes, plus the Tama drum throne and the Pearl kick pedal that I ordered. The creature on top is Sharkie, who is hiding from our kitten, Boojie. 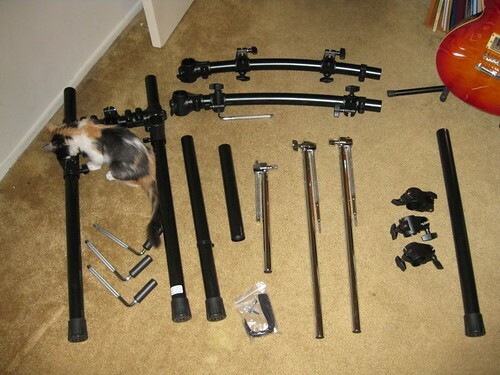 The first step is to unpack the parts for the rack. 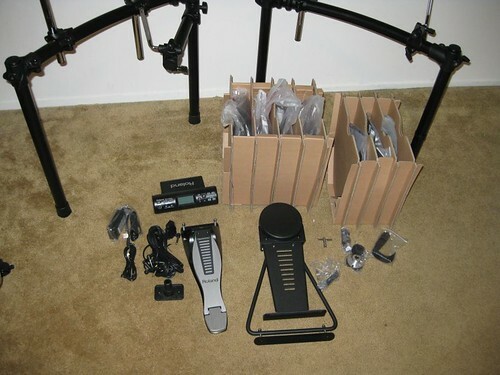 The packaging is well designed and the parts are light, solid, and well-made. 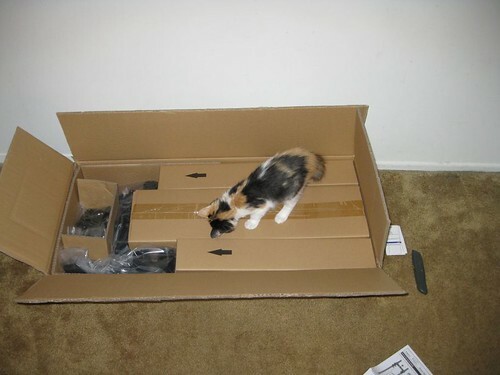 Here the packaging is being inspected by Boojie, who helped throughout the assembly process. The parts were all present and accounted for. Boojie actually enjoyed the packaging more than the drum hardware. The rack assembly took about 45 minutes, with the help of the kitten. Then I opened the second box. Here are the items it contained laid out on the floor. The instructions were not hard to follow, except that in one picture the image was either flipped or it was set up for a left-handed drummer. No big deal. Here is the kit completely assembled, but not adjusted for playing. Everything can be moved up and down, side to side, and tilted. The wiring harness is clearly marked and easy to hook up. The 25 kits sound good, and everything works. I need to put something under the pedals to keep them from moving around. Other than that, the only problem is that, as I suspected, drumming is more difficult than it looks. A lot of practicing is in order. It will be fun though. Sharkie looks so excited about the drums. I think his arms are a little too short to play properly though, poor thing. About a month ago, I was torn between the TD4 and TD9. My wife was with me and kept nudging me toward the 9. When the salesman at GC finally asked which one I wanted, I made up my mind and picked the 9. My unpack and build was remarkably similar to yours. A lot like (a grown up’s) Christmas! My DW4000 pedal, the KD8 and FD8 all have ‘spikes’ to secure them to the carpet. I just kept extending them while/after playing until everything stayed in place. 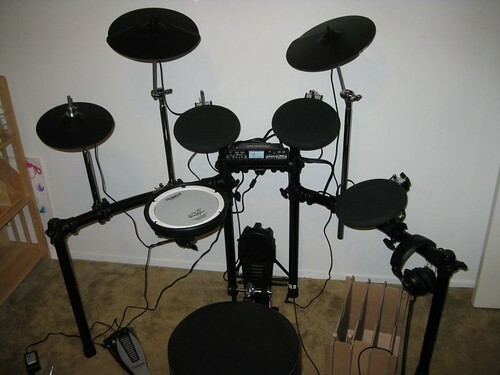 I have been playing (around) on guitar and mandolin (electric) before getting the drum kit. I agree that drumming is a lot harder than it looks. But, I’m ready and committed to the experience. Yes, I went back and forth thinking about the TD-9 and the TD-4. I finally went with the TD-4 because my main purpose was to trigger VSTi drums through midi, and I wouldn’t be playing out. Also, I don’t have a lot of room. I may regret my choice later, but right now I think it was the right one for me. I have discovered the spikes you are talking about. They help a lot, but I think the main problem was just that my feet weren’t used to operating pedals.